LionsDeal > Tabletop & Bar > Restaurant Dinnerware > Melamine Dinnerware > Asian Melamine Dinnerware >< Temoku Melamine > Thunder Group 3955TM Tenmoku Melamine Flat Bowl, 9 oz. Thunder Group 3955TM Tenmoku Melamine Flat Bowl, 9 oz. Give your tabletop presentation a needed boost with the Thunder Group 3955TM Tenmoku Melamine Flat Bowl, 9 oz. 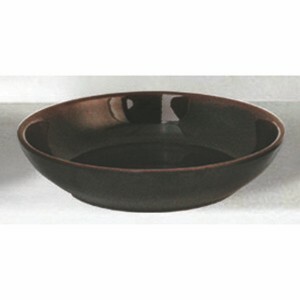 This reddish brown melamine bowl has the look of glazed ceramic but is far more durable. Perfect for serving eggrolls, sushi, dips and spreads, this attractive bowl washes up safely and beautifully in a dishwasher.